Richard Elmore on school reform. I’ve really enjoyed reading Elmore’s book on school reform: School Reform from the Inside-Out: Policy, Practice and Performance (2008). It is clearly grounded in a US context but it still presents a coherent argument about the (lack of) interplay between policy, practice and accountability, which is relevant across all education systems. He exposes policies such as No Child Left Behind as flawed, in their construction; done to educators rather than done with them; in their narrow focus on accountability via results, and in their failure to acknowledge the crucially important role of instructional capacity in the improvement process and then make investments in it. He sees the irony of how for policy makers schools are simultaneously regarded as “the cause(s) of failure and the source(s) of success” (Elmore, 2008, p217). Incentives for improvement are so far not on the agenda in Scotland as far as I know, but our neighbours south of the border may be more familiar with some of them, for example attainment data published as league tables, designation of failing schools etc. Elmore describes these as “blunt instruments” (p113) which have no relationship to the practice of improvement and don’t articulate a method for improving the learning and performance which will provide the response to the sanction or incentive. On so –called failing schools, Elmore shares observations from many schools he has visited and makes a very interesting and insightful comment. He sees more similarities between failing and successful schools than might be imagined, notably problems in identifying and articulating quality of instructional practice. The “successful” schools produce performance data that is based not on quality instructional processes but on the “income and cultural capital of parents and communities (that) overrides the defects of the schools” (Elmore, 2008, p237). In effect Elmore is suggesting here that successful schools are experiencing the same problems as failing schools with identifying effective instructional practice that improves student learning and performance, they just disguise the instructional problems with affluence and parental interest/engagement. This sounds like a very good reason for not pairing successful and failing schools in the name of school improvement. The successful school is unlikely to be in a position be able to identify why it is successful in instructional and practise-focused terms, therefore also unable to supply the necessary knowledge for the failing school to improve. Elmore talks a lot about cultural and especially structural conditions, but makes no reference to Margaret Archer’s theory of critical realism. I am increasingly seeing his work and what is going on in Learning Rounds as being relevant to this theory . In the previous post I began to see the connections between the instructional core and morphogenetic/morphostatic processes. Here the focus is more on identifying the conditions: what structural conditions in Learning Rounds need to be in place to facilitate professional learning and improve teachers’ instructional practices? Do relationships influence this? What values and beliefs are held that allow changes to occur? How are these changes in practices manifested and sustained? If I can manage to connect both these reflections I might be one step closer to nailing my research questions and getting this project off the blocks. 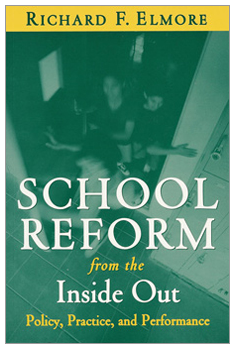 School Reform from the Inside-Out: Policy, Practice and Performance (Harvard University Press, 2008). This entry was posted in CPD, Learning Rounds, PhD, Teacher Education and tagged Elmore, improvement. Bookmark the permalink. 1 Response to Richard Elmore on school reform. Interesting! I’ve long felt that the bulk of the reason why many students succeed is not “what the schools do” but “what the parents do”, which is why home education shows such remarkable success – it strengthens the stronger component of the system, where potential gains are largest. Yes, it is possible for some parents to fail at home education – they’re the same ones who fail at educating their child for a government school. What the successful parents do is interesting, I believe. Now, is home education the only solution? No. I believe parents can contribute in other ways, and both James Tooley and Andrew J. Coulson have some ideas to offer along those lines.